And 20 years later…..? IDIOTS!! Think I’ll use this one in a presentation. How much does this brown nose get paid? He got a raise and they doubled his salary in 2000 when the prediction failed! It is to late to do anything now as we passed the tipping point 10 years ago. So eat, drink, and enjoy life. The alarmists have been around long enough to have a track record and it’s pretty wretched. The “hockey stick” is already looking very shaky. Maybe he applied for a government extension on his prediction of apocalypse. Hey, it HAS to happen someday! I think the deal here is you MUST say that something VERY BAD …. MIGHT happen. This creates your notoriety. If you’re wrong, you were just being precautionary, but you keep your credibility, and get a job at the white house. There is no down side. The guy who said nothing out of the ordinary would happen is ignored. He’s working at an unknown junior college. The POST says “UN : Entire Nations To Be Drowned Before The Year 2000” the QUOTE says “if global warming is not reversed before 2000”. There is, in fact, no time line stated for when the events would happen, so Steve’s post is just not accurate. Now if he had said that if climate change is not reversed by 2000, Hansen says Manhattan will be under water by 2010, well then I would owe Steve some big apologies. Do you ever get hurt stretching so hard? The real question Tony is why to you defend this? I know Tony, you are superior. I get it. But even coming from your argument, Tony Duncan, the headline of the post is still correct. They say it’s a done deal by 2000 so Steven Goddard is right. Sorry, didn’t mean to point out the flaw in your argument as you were enjoying your “fun”. If Steven Goddard’s headline is wrong then you are wrong too, Tony. Glad to see I was not disappointed in the responses. it is not possible to defend a post that is just flat out wrong in its assertion, yet I have 8 comments that attempt to do so. The quote does not say countries will drown by 2000. Steve’s post says that the UN says they will. End of story. Steve is stating something that was never said. And then some change the subject and assume I agree with the quote because I pointed out that what steve said is inaccurate. Inanity followed by baseless assumption. You are thick as a brick, and probably still think that Hansen didn’t predict Manhattan to be drowning by now. Where do you think the UN official got his information from? I beg you to parse through your voluminous archives and find one instance where I denied Hansen said the quote. For God’s sake. there is no way I could check, so just make one up and post it. Again, Tony, you missed what Steven Goddard just said. If 2000 was not the date then how could we know if he was right? Now THAT Would be a good tittle for this post. it would be accurate and it would raise a serious question about the value of the quote if there is no timeline. Too bad you aren’t writing these posts. You are trending off into ChrisD moron territory. Because your post points out the pointlessness of making a prediction without real parameters, whereas Steve is just wrong. Does the possibility ever occur to you that you might be wrong? No. That’s not what the post is doing. That is what you are seeing it doing. You should create your own blog and come at things from the angle you see. That way there won’t be these misunderstandings. Did you consider that the post is showing how wrong global warming predictions are and therefore we shouldn’t believe in it? Of course I considered that. That is the underlying message of every post Steve makes. If he had used you comment to make the point it would have been quite valid. As it is he said something that was not true. You seem to get upset when ACC supporters do that. You seem to get upset when ACC supporters do that. Why do you think I am upset? That is how you are seeing it? So if the article is correct, since AGW was not reversed by 2000, which “Entire Nations” do you think “are going to “be wiped off the face of the earth?” You are smart enough to know the article implies that this will occur in the not to distant future, so the “no time line” card is simply not reasonable. You do have a saving grace, the world COULD is used here and in every single paper/article about AGW, since it is only a poorly concieved theory with no real supporting evidence. You will not find WILL statements in these papers/articles because there needs to be wiggle (CYA) room. 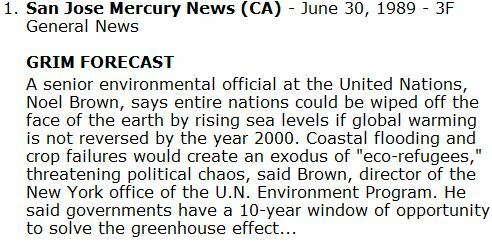 I will say with 100% confidence no entire nation will be wiped off the face of the earth by AGW. I don’t need the words ‘could’ or ‘may’. if the article is correct. I would guess the maldives, Seychelles, and corral reel based islands in the south pacific. You can assume the article implies sometime in the not too distant future. Is that 20 years? 50? 70? See amino’s comment above. if it is 70 years then maybe the “no timeline card” is reasonable. I think basing ones reaction to this article on the word “could” would be disingenuous, and would thus be unreasonable. And kudos for you to man up and say there is no possibility of any country drowning or mass exodus etc from ACC. THAT someone 50 or 70 or 200 years from now can definitely say was wrong, if any country does drown by then. So if it’s 70 years from now how in the world would we ever know we did the right thing 11 years later, by 2000, to stop it? We are just supposed to trust that what they say we need to do will work? We are supposed to believe they are that smart? Or should we think they are using that old saying, “There’s a sucker born every minute” to get people to believe they know what we should do by 11 years from then to save cities from being under water 70 years later? That is why I am asking you why do you defend these things?! if the article is correct. Wow, you don’t even know if it is or not. you are constantly making assumptions about what I believe that are not based on what I write. I did not defend that article. Nothing in what I wrote gives any indication of defending the article. You could just as easily said Steven Goddard was right. You could have construed it that way if you wanted to, and found humor in what the UN said. But as it is you chose to view it in a different way and then find humor in those who did not agree with you. You could have construed it just any way you wanted to. But it appears you are a global warming believer who also has a superiority complex. if one wants to construe. The fact of the matter is that Steve wrote something that was not true. If HE wants to construe the statement in way that has nothing to do with what anyone was saying so as to try to create some appearance that what he wrote was just blatantly irrefutably untrue, he is perfectly entitled to do so. We are not talking science her but plain old english words. Can you comment on the 10-year window of opportunity which has long elapsed? So here’s another failed prediction. Yet global warming believers continue to believe, and to find labored reasons to keep believing. Steve without comment provided a link to a newspaper report. Having made no assertions about the report he can’t possibly be wrong. Tony Duncan appears to be delusional. the title of the post actually has words in it. Those words made a declarative statement. the quote in the article does not say the same thing as his statement, therefore Steve’s statement is wrong. You just don’t know when to quit. Only when people defend the indefensible. it is quite fascinating to me. as I wrote, Amino’s comment was quite valid and reasonable. You’re absolutely correct. In the year 2000 the world hit a tipping point leading to the imminent demise of Manhattan by the year 2008 and the drowning of entire nations.